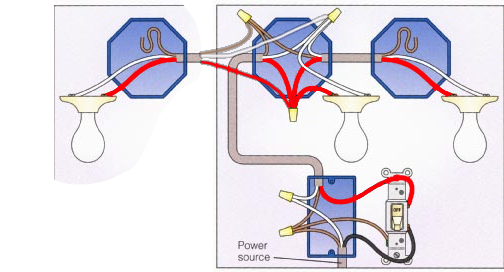 I'm looking at lighting a kitchen in a wood cabin and to try and make the wiring (which will sit on the outside of the ceiling) as neat as possible, I'm wondering if I can wire 3 separate lights in the fashion I've illustrated below (taking an illustration that was done for 2 lights and trying to add a third, but not in a daisy chain fashion). People use black and white because they only sell NM cable in black-white or black-white-red. We certainly wish we could use more illustrative colors. Let's recolor the wires to indicate their actual function. You can do the same thing with colored tape. With red being switched-hot, it seems clear you are doing the right thing. neutral should be available in the switch box for future smart switches check. How should I add lighting to a low ceiling basement? De-coupling fan and lighting switches? Help with electrical plan. What's right, wrong, suggestions? Want to add lights to existing outlets - beginning of circuit or end? How can I add a switch into an existing circuit but only control some of the circuit?